In memory of David Shepherd, a member of the CCI Mathematics Department from 1975 to 2008, who passed away on January 18, 2016, this award is to a graduate continuing to post-secondary who demonstrated excellence in Grade 12 Mathematics, participated in co-curricular activities and demonstrated sportsmanship and dedication to school sport. Here is the list of winners. David was a dedicated teacher of Mathematics and Computer Science as well as dedicating himself to the world of sport as a coach of Cross-Country Running and Track & Field. During his years of teaching and in the years since his retirement he has worked tirelessly to promote excellence in students and athletes. 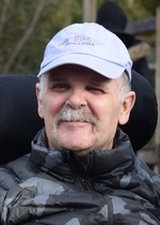 He had a passion for mathematics enrichment and was very involved with the University of Waterloo CEMC math contests, writing and reviewing the tests themselves and encouraging students to pursue them. ﻿Donations to this award can be made as follows: drop off or mail a cheque to CCI (address above) payable to Collingwood Collegiate Institute Activities with "David Shepherd memorial donation" indicated as the memo. Please include your mailing address so that a charitable contribution receipt can be issued.